Jules Maeght Gallery is pleased to announce the exhibition Derrière Le Miroir, a selection of prints and original works by notable Modernist artists that help tell the story of the Maeght family’s close interactions with artists; both in the gallery and in the printshop. 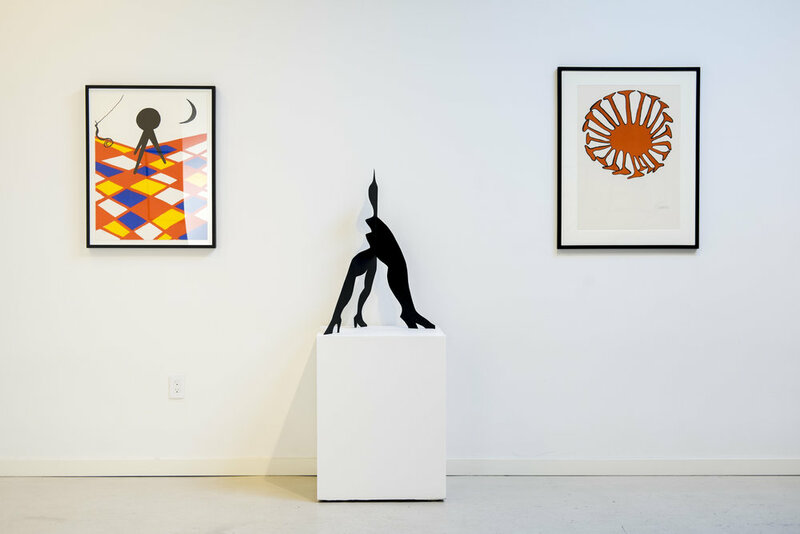 Works by Pol Bury, Alexander Calder, Alberto Giacometti, Ellsworth Kelly, Joan Miró and Saul Steinberg will be presented. The exhibition celebrates Derrière Le Miroir, the contemporary art review published by Aimé Maeght, that for forty years displayed a dedication to the dispersion of contemporary art, printing, publishing, writing and collaboration. Beginning in 1946 with the issue Le noir est une couleur, which included original lithographs by Geer Van Velde, Derrière Le Miroir was published until 1982, finishing with #250, an homage to Marguerite and Aimé Maeght. The printshop was very important to the Maeght family. A hub of creativity where writers, printmakers, and artists influenced and taught one another, the publications that emerged from the ARTE printshop sought to expand the reaches of contemporary art. The issues of Derriere Le Miroir were non-signed and non-numbered, which ensured an unprecedented level of accessibility. Quality works of boundless imagination from the most celebrated creatives of the era, in prose and picture, could be easily attained through the publication of the review. The two hundred and fifty editions of Derrière le miroir invite the reader to discover the original works from a myriad of artists, authors, and poets. The exhibition will display numerous issues of Derrière le miroir alongside original lithographs and etchings by select artists. Visitors are encouraged to not only see the works on the walls, but to read through the printed catalogs. Such longstanding dedication to Derrière Le Miroir’s publication evokes the Maeght family’s enduring passion and support for the artists and authors that they called their friends.